Kaytee Fiesta Cockatiel will make your bird whistle with delight when they see this gourmet diet full of variety and taste. 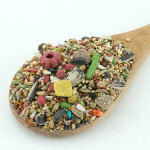 It contains all of their favorite foods including seeds, millet, peanuts, raisins, papaya, carrots, and more. This premier blend of fruits, vegetables, seeds and grains is full of the nutrition that your Tiel needs and includes everything they love! 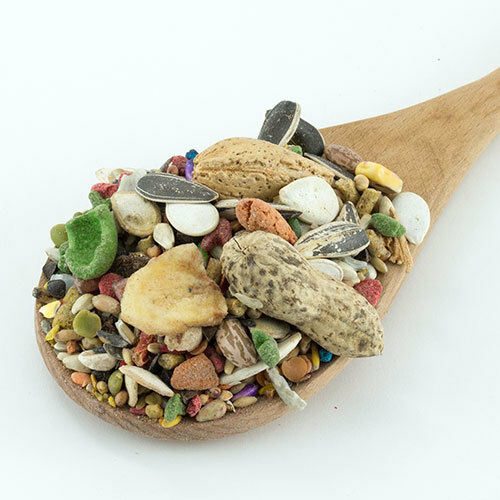 The best part is this gourmet mix contains DHA, Omega-3 and probiotics to support your pretty bird's heart, brain, and visual functions as well as give them digestive and immunity support. Made in USA. Kaytee Fiesta Parrot provides variety of tastes, colors and shapes they can't resist. They will strut their stuff after eating this healthy gourmet mix of seeds, nuts, fruits and veggies. 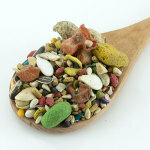 It is fortified with vitamins and minerals to give parrots all the nutrition they need plus includes DHA, Omega-3 and probiotics to support your parrot's heart, brain, and visual functions as well as give them digestive and immunity support. It tastes delicious too! They will enjoy this rich mix of sunflower seeds, almonds, pineapple, red peppers, carrots and more. Made in USA. The Fiesta Macaw Diet combines all the nutrients your bird needs with Omega-3 fatty acids and probiotics to support their immune and digestive systems. Your Macaw will savor the tastes and enjoy the rich textures of Sunflower Seeds, Almonds, Pumpkin Seeds, Bananas, Raisins, Carrots, and more. Give your Macaw this delicious gourmet blend made just for them and they'll be squawking for more! Made in USA. Storage instructions: A naturally preserved product needs special attention to maintain maximum freshness. Remove air from package and reseal tightly. After opening bag, use the food within 30 - 45 days. Store in a cool dry location. Refrigerate or freeze for extended storage. Canary Grass Seed, White Millet, Safflower Seed, Oat Groats, Sunflower Seed, Ground Corn, Red Millet, Wheat, Calcium Carbonate, Dehulled Soybean Meal, Corn Gluten Meal, Ground Wheat, Buckwheat, Shelled Peanuts, Flax Seed, Raisins, Dried Papaya, Niger Seed, Green Split Peas, Wheat Middlings, Rice, Dehydrated Carrots, Cantaloupe Seed, Dicalcium Phosphate, Ground Rice, Coconut, Soy Oil, Salt, Ground Oat Grouts, Dehydrated Apples, Dehydrated Peppers, Algae Meal (source of DHA), Corn Sugar, Wheat Germ Meal, L-Lysine, Dried Whole Egg, Dried Beet Pulp, Brewers Dried Yeast, Fructooligosaccharide, Sun-cured Alfalfa Meal, Vitamin A Supplement, Choline Chloride, Vitamin E Supplement, Vitamin B12 Supplement, Yeast Extract, Riboflavin Supplement, DL-Methionine, Mixed Tocopherols (a preservative), Ferrous Sulfate, Manganous Oxide, Zinc Oxide, Titanium Dioxide, Rosemary Extract, Citric Acid, Orange Oil, Menadione Sodium Bisulfite Complex (source of vitamin K activity), Copper Sulfate, Cholecalciferol (source of vitamin D3), Calcium Pantothenate, Pyridoxine Hydrochloride, Thiamine Mononitrate, Canthaxanthin, Folic Acid, Calcium Iodate, Cobalt Carbonate, Biotin, Dried Bacillus licheniformis Fermentation Product, Dried Bacillus subtilis Fermentation Product, FD&C Red #40, FD&C Yellow #5, FD&C Blue #1, FD&C Red #3. Sunflower, Safflower, Oat Groats, Pumpkin Seed, Ground Corn, Wheat, Corn, Peanuts, Almonds, Raisins, Dried Papaya, Green Split Peas, Milo, Shelled Peanuts, Buckwheat, Ground Wheat, Oyster Shell, Dried Bananas, Dehulled Soybean Meal, Corn Gluten Meal, Pinto Beans, White Northern Beans, Wheat Middlings, Ground Flax Seed, Dried Pineapple, Red Peppers, Red Lentils, Filberts, Dehydrated Carrot, Ground Rice, Pistachios, Dehydrated Sweet Potatoes, Sun-cured Alfalfa Meal, Calcium Carbonate, Dicalcium Phosphate, Ground Oats, Soy Oil, Dried Coconut, Dehydrated Apples, Pinenuts, Salt, Algae Meal (source of Omega-3 DHA), Dried Beet Pulp, L-Lysine, Wheat Germ Meal, Corn Sugar, Brewers Dried Yeast, Fructooligosaccharide, Dried Whole Egg, Vitamin A Supplement, Choline Chloride, Dried Cane Molasses, Yeast Extract, DL-Methionine, Vitamin E Supplement, Vitamin B12 Supplement, Riboflavin Supplement, Mixed Tocopherols (a preservative), Potassium Sulfate, Ferrous Sulfate, Zinc Oxide, Rosemary Extract, Citric Acid, Manganous Oxide, Menadione Sodium Bisulfite Complex (source of vitamin K activity), Titanium Dioxide, Niacin, Calcium Pantothenate, Orange Oil, Vanilla, Copper Sulfate, Pyridoxine Hydrochloride, Cholecalciferol (source of vitamin D3), Thiamine Mononitrate, Folic Acid, Canthaxanthin, Calcium Iodate, Cobalt Carbonate, Biotin, Beta-Carotene, Sodium Selenite, Dried Bacillus licheniformis Fermentation Product, Dried Bacillus subtilis Fermentation Product, FD&C Yellow #5, FD&C Red #40, FD&C Blue #1, FD&C Red #3. Allergen information: Contains peanuts and/or other tree nuts. Sunflower Seed Safflower Seed, Ground Corn, Corn, Almonds, Whole Peanuts, Pumpkin Seed, Ground Wheat, Oat Groats, Dried Bananas, Green Split Peas, Wheat, Dehulled Soybean Meal, Corn Gluten Meal, Filberts, Dried Papaya, Raisins, Buckwheat, Canadian Field Peas, Pistachios, Dried Pineapple, Oyster Shell, Shelled Peanuts, Wheat Middlings, Ground Oat Groats, Dehydrated Carrots, Ground Flax Seed, Ground Rice, Coconut, Pinenuts, Dried Red Peppers, Pinto Beans, White Northern Beans, Calcium Carbonate, Dicalcium Phosphate, Dehydrated Apples, Soy Oil, Salt, Dried Whole Egg, Algae Meal (source of Omega-3 DHA), Sun-cured Alfalfa Meal, Corn Sugar, L-Lysine, Wheat Germ Meal, Brewers Dried Yeast, Dried Beet Pulp, Vitamin A Supplement, Choline Chloride, Fructooligosaccharide, Yeast Extract, Dried Cane Molasses, DL-Methionine, Vitamin E Supplement, Vitamin B12 Supplement, Riboflavin Supplement, Mixed Tocopherols (a preservative), Titanium Dioxide, Ferrous Sulfate, Zinc Oxide, Rosemary Extract, Citric Acid, Manganous Oxide, Menadione Sodium Bisulfite Complex (source of vitamin K activity), Niacin, Calcium Pantothenate, Orange Oil, Copper Sulfate, Pyridoxine Hydrochloride, Cholecalciferol (source of vitamin D3), Thiamine Mononitrate, Folic Acid, Canthaxanthin, Calcium Iodate, Cobalt Carbonate, Biotin, Beta-Carotene, Sodium Selenite, Dried Bacillus licheniformis Fermentation Product, Dried Bacillus subtilis Fermentation Product, FD&C Yellow #5, FD&C Red #40, FD&C Blue #1, FD&C Red #3. Allergen information: Contains peanuts and/or other tree nuts.